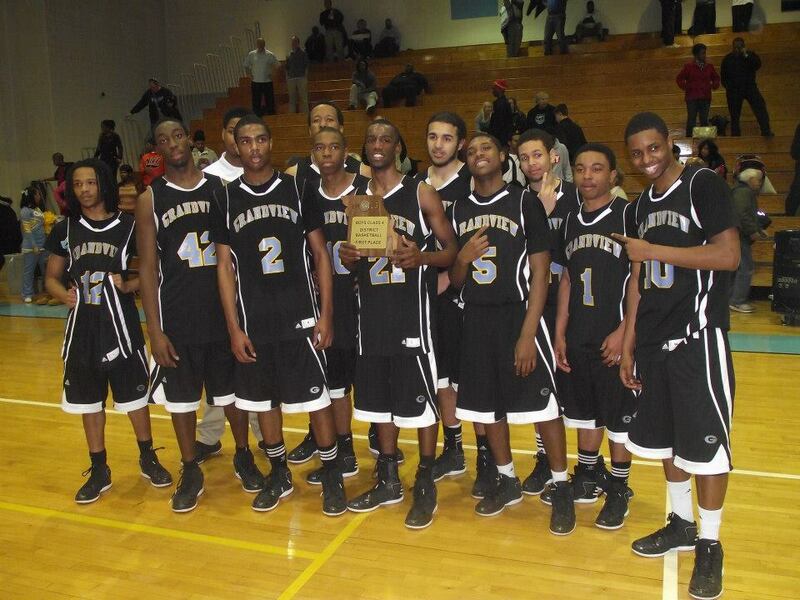 The Grandview Bulldogs continue along the road to redemption. The Bulldogs (15-12) upset district favorite Center (21-5) in a wild 68-65 victory Monday night in the Class 4, District 14 championship game. The loss avenged Grandview’s 52-35 season-opening loss to Center on November 30, when star junior guard Tyrone Taylor was the only Bulldog in double figures with 12 points. Flash-forward three months, and Grandview is riding a six-game winning streak, hoisting the district championship trophy, and heading to sub-state. before adding 21 points and 16 rebounds in an enormous game Monday night against the favored Yellowjackets. Nweke was also 9 of 12 from the free-throw line, with many of his attempts coming in the game’s crucial final minutes. The moment never got too big for the level-headed Nweke. For the Grandview coaching staff, Nweke’s breakout performance was vindication for the faith they’ve shown the big man during his three years at Grandview High School. For his part, Nweke says that the playing time he received as a freshman and sophomore helped prepare him for Monday’s district championship game. Nweke was about the only person who was relaxed in the Grandview High School gymnasium as the final interminable seconds ticked off the clock Monday night. Grandview held a seemingly comfortable 60-46 lead with 4:16 left in the game, and were up by as much as 13 with less than three minutes in the game. But Center, one of the best teams in the city, wasn’t quite ready to give up on the season yet.The Yellowjackets turned up the full-court pressure in the final minutes, forcing several untimely Bulldog turnovers as Grandview tried to wind down the clock. The Bulldogs, though, had trouble even inbounding the basketball against the ferocious and desperate Yellowjackets. overtime session with just nine seconds left in regulation. Center got one good 3-point attempt, but the shot careened off the back iron and the Yellowjackets never had another attempt. Grandview had won the district championship. Taylor admitted that after the 17-point loss to open the season, the victory was made sweeter by the fact that it happened against Center. Nweke said after the game that the team’s semifinal win against Raytown South was an important confidence boost for the Bulldogs. Raytown South had previously beaten Grandview twice in close contests, including an eight point win on Grandview’s home court in mid-February. Despite the home floor advantage, Center brought a strong fan contingent to the game, and created an electric environment in the building. Those fans were able to make themselves heard early in the game, when Center took an early lead during a frenetic first quarter. Farris called a timeout with his team down 13-4 and two minutes left in the quarter, both to calm his team and to let his players know that they needed to keep doing things the right way, and results would follow. It may have been Farris’ best timeout of the season. Grandview steadied to finish the quarter on 7-6 run, bringing the Bulldogs within a manageable eight points of Center. By the time the quarter ended, Grandview had not only quashed Center’s early momentum, but developed some of their own as well. Once the second quarter commenced, the Bulldogs rode a highly entertaining 18- 3 run to a six-point halftime lead they would never relinquish. The victory earns Grandview the right to face Pleasant Hill in yet another chance at redemption. Pleasant Hill beat Grandview 62-52 in a 9 a.m. tournament game at William Jewell on December 26. It will be yet another game that Grandview circles on the calendar, eager to make amends for a loss they felt should have been a victory. up and down season. Their road to redemption continues onward.